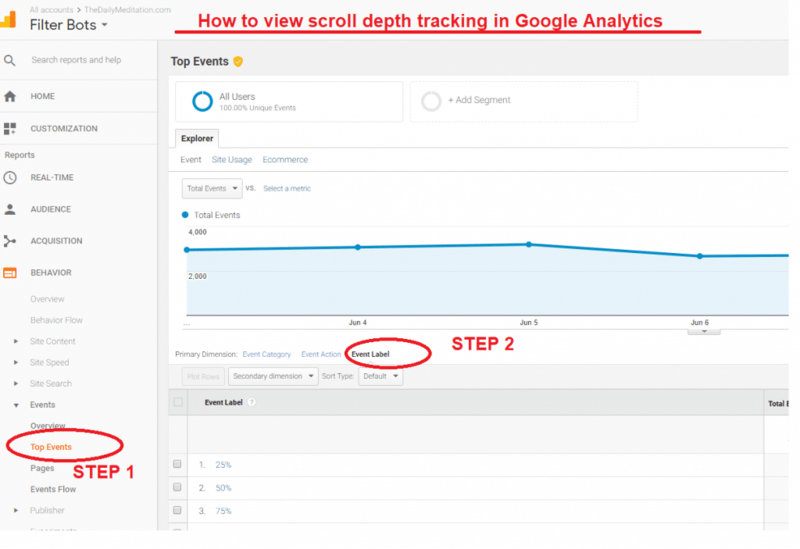 One of the best events to track in Google Analytics is scroll-depth tracking. Scroll depth tracking allows you to measure how far down the page your readers scroll. But this is a massively misunderstood event. 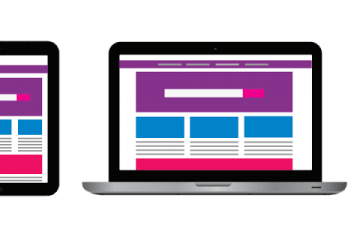 You might think that the aim is to get your visitors to scroll 100% of the page—in other words, to make your visitors see all of your page. But this is simply not accurate. And if you’ve been looking for a scroll-depth benchmark you might be disappointed. There are very many different elements that effect scroll depth. And there are tons of benefits of scroll depth tracking, not least that it can be very helpful for improving conversion optimization strategy. Let’s investigate this often misunderstood Google Analytics event tracking metric. In order to set-up scroll depth tracking in Google Analytics you will need to place a code on your website. There is an easy way to do this and a hard way. The easy way is to use a WordPress plugin for scroll depth tracking. 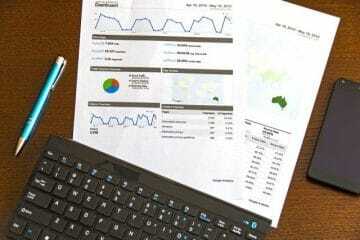 I personally use Google Analytics Dashboard For WordPress plugin for scroll depth tracking. You can download GADP here. This is how to event track scroll depth in WordPress. You can also do this manually by adding a code to your site, either by using Google Tag Manager or installing a code manually. Here is a guide by Simoahava. Once you have completed the above steps you will be able to track scroll depth in Google Analytics. Are there scroll depth tracking benchmarks for Google Analytics? Many people have asked me if there are scroll depth tracking benchmarks to use in Google Analytics. It simply does not make sense to use scroll-depth tracking benchmarks in Google Analytics. You cannot baseline scroll depth tracking, except for in one situation, which I’ll share in a moment. More people will scroll to the bottom of a very short article than a very long one. And that does not mean that the short page is superior, just that there is less page to scroll. Then there’s also the fact that people might click on a link near the top of your article. In this instance, your scroll-depth tracking for the current page will be low, even though the page has been successful and has led to people navigating further into your site. One of my sites features articles that are over 3000 words long with links all the way down the page. Do you think a low-scroll depth on such a page is a sign of a low-quality blog post? You can see why you shouldn’t use scroll depth tracking benchmarks now, right? Now as I mentioned, there is an exception. If you always write articles of the same length you can get a good idea of the scroll depth benchmark for your own site and use this for comparisons. One option is to use pixel depth tracking instead [here’s a GA plugin], which gives a more accurate measurement. Reality is: there are much smarter ways to use scroll depth tracking for optimization. The single best question to ask yourself when tracking scroll depth in GA is: How many people scroll your website at all? If your website visitors do not scroll the website at all, it can be a sign of bad design or of a technical problem. View your scroll depth percentage in Google Analytics. Is your page scroll depth bad for a particular device? If you view scroll depth in Google Analytics and it’s low for a particular device or browser, view your site in that specific device and browser to check for problems. 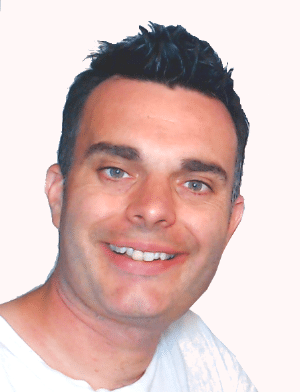 To get the most out of all your traffic you will want to make use of the areas of your site where people drop out. Let’s say, for instance, that a high percentage of your traffic drops out at 50% scroll depth. This is where people are losing interest in your current article. In areas where people lose interest like this, add additional elements, such as related posts, to keep visitors engaged with your site’s content and to reduce bounce rate. You can also compare your Google Analytics Event Tracking against other metrics to get some valuable information. Here’s how. This means that people are looking around your page but they are not engaging with any of your links. This can be a sign that your site is loading properly and the design is fine, but you need to do more to make people read your other content. Redesign internal links (bold them, change link color etc). Visitor to your website are finding good related content to click on, but they are not reading your actual article. Your landing page need to be rewritten. Follow this guide to writing blog posts. This means people are looking around your page, but they are not staying for long. It could be that your article is too short, and they are not viewing other posts. Include more links and make your article more in-depth. Visitor to your site are not looking around your page but instead are staying above the fold. This could be because you have above-the-fold content that holds their interest (such as a video). It could be because they are immediately clicking on an internal link or an external link, so they are navigating away from your page before scrolling. As we discussed above, there is no sense looking for average scroll depth benchmarks because your site is its own unique thing, with its own design, and your articles may be much longer or shorter than average. Best practice is to use your own scroll depth benchmarks. Repeat: This is unique for my site which features very long articles. If your articles are shorter your average scroll depths will be register much higher—more people will scroll deeper. Scroll depth tracking is an important tool for measuring how people engage with your site. That said, your best off setting your own scroll depth benchmarks based on your site averages than comparing to other sites, for the reasons we have looked at above. Use scroll depth tracking to determine where people are dropping out of your pages and why, and then make the appropriate adjustments. If you would like help with this, contact me.